Hello and welcome to my blog. It’s only 10 days until the Commonwealth Games start on the 4th April. Yesterday I attended my last training session which was held at the Belmont Shooting Centre. I’m just a little bit excited for my first day on the 8th. This week at CASEing the Catty we are back to CASEing the Sale-a-bration Catty for the last time. There’s only 6 days left of Sale-a-bration. You may have hopped over from Julia, thanks for continuing on with me. I’ve CASEd the card on the right hand side of page 12. Instead of using the Epic Celebrations stamp set I’ve used Bird Banter. My card base is Basic Black layered with a couple of pieces of Pick a Pattern DSP. I’ve stamped my cute little “galah” on Flirty Flamingo cardstock then used my watercolour pencils to colour him in. I’ve used the Ticket Tear Border Punch on the ends of the sentiment and popped some Pick a Pattern Washi Tape and Mini Silver Sequin Trim behind it. As soon as Marvi saw the birds on my card he wanted to help with the photos. Next on tonight’s hop is Judy, just click on the link below to hop straight over to her gorgeous project. Would you like to join our Weekly Challenge? We’d love to see what you create. Hello and welcome to another Sunday night CASEing the Catty Blog Hop. This week we are CASEing Tutti Frutti, pages 28-35. You may have started your hop with me or you’ve hopped over from Julia, make sure you click on the “Next” button at the end of my post to see all of the amazing creations the Crew have in store for you tonight. I’m CASEing the card on the left hand side of page 32. My card is very similar to the original. I’ve used Lemon Lime Twist as my card base and I’ve added in a layer of Bermuda Bay. I die cut 8 Silver Foil bottle caps with the Bottles & Bubbles Framelit Dies. Instead of using the stamp set for the images on my bottle caps I’ve used the Sale-a-bration Bubbles & Fizz DSP. I’ve punched the images out with my 3/4″ circle punch. The sentiment is from the Bubble Over stamp set and I’ve attached some Lemon Lime Twist 3/8″ Mini Striped Ribbon behind it. Next on tonight’s hop is Rebecca, just click on the next button to hop over to her fabulous project. Would you like to join our weekly Challenge? Click on the button below and send us a request to join, it’s that easy. Hello and welcome to my blog. It’s been another busy week for me. On Friday I had a trip to the Gold Coast to collect my Volunteer Commonwealth Games Uniform. It’s under a month now until my first day as a Volunteer on Sunday 8th April. 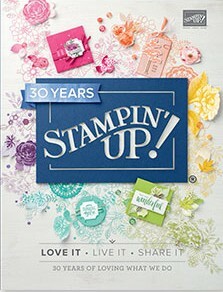 That will be a huge weekend for me as I’m attending Stampin’ Up! Onstage in Sydney the day before. This week at CASEing the Catty we are CASEing from the Sale-a-bration Catalogues again. You may have hopped over from Julia, thanks for continuing on with me. I’m CASEing the card on the right hand side of page 8 of the Sale-a-bration Catalogue. Are you surprised I’m not using the card on the left………again? I hadn’t inked up the lavender from the Lots of Lavender stamp set yet. I’ve used Petal Garden DSP on a Thick Whisper White card base. I’ve added a smaller layer of Springtime Foils Specialty DSP, a Delicate White Doily and a layer of Soft Sky with the lavender image heat embossed in Silver. The sentiment is from Banners for You and I’ve used the matching Bunch of Banners Framelits to die cut it. I’ve added some Silver Metallic Thread behind the sentiment. 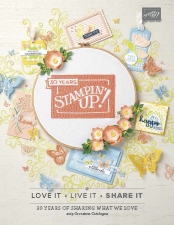 Next on the Blog Hop tonight is Sandra, you’re going to love her project.